Baseball Fan Lou Di Lillo’s email submission to Baseballisms.com reprinted with permission. I grew up in Westbury, Long Island in the 60’s and 70’s. One day my brother and I heard noise in the back of our yard. A man was in the adjacent yard breaking up wooden shipping pallets by pitching baseballs at them. We pushed our faces against the fence mesmerized by his speed, accuracy and power. When he was finished he went inside his house for a minute than came back to the fence and tossed us each an autographed ball of our beloved Yankees. 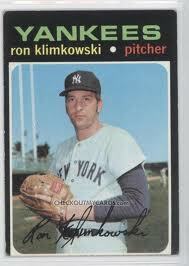 That was Ron Klimkowski. I still have the ball. I live in Massachusetts now but will not give up my Yanks. Do you have a story like Lou’s? We would love to hear from you! 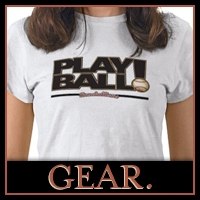 Send a Tweet to @baseballisms with a quick message, send us an email or visit our Upload page with a video message. We look forward to growing a community of fans interested in the poetry of the game of baseball!